The DCE provides accurate low cost instrumentation for 3 banks of batteries between 9.5 and 33 volts. 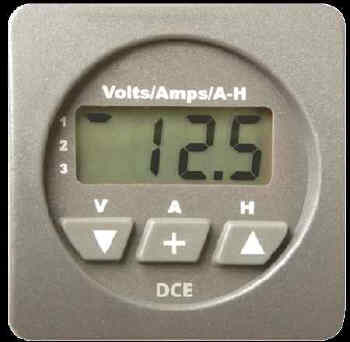 The unit displays voltage for three banks and amps or amp-hours for the house bank. It tracks all current entering and leaving the house bank and applies Peukert's and efficiency factors. Low and High voltage alarms and Low Amo-Hours Remaining alarms can be set on the house bank. When activated, the built-in 85 dB alarm will sound and the display will flash. The DCE outputs NMEA 0183 serial data or the data line can be programmed as an external alarm output or as a charger on-off control. 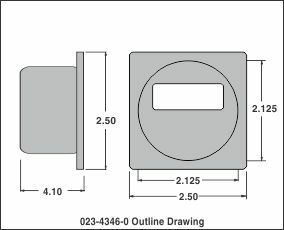 The DCE comes complete with a precision 500 amp shunt and is designed to work with 50-500 amp 50 mV shunts.